5.0/5.0 Based on 14 reviews. Glue Dots are patterns of glue which can be applied nearly anywhere. They are pressure sensitive adhesive dots, making them a smart solution for print, packaging and assembly application. 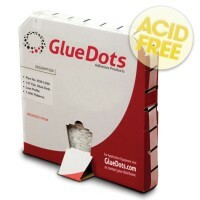 Glue Dots help keep items aligned and secure by forming a strong bond with almost any surface, instantly! What are Glue Dots?